The eastern sea shore opposite to the Ramanathaswamy temple is named as Agni theertham . This is one of the 64 sacred baths in Rameswaram (theerthams), Every day thousands of pilgrims took bath in this holy sea .Holistic rituals such as prohithams, yangnya(yaham), tharpanam(ritual for the ancestors who were dead) has been performed in the shores of Agni Theertham. It is believed that, by took bath in this sea will vanish ones sins, and make them pure again, and mixing the ashes of the dead person in this sea (Agni Theertham) will brings peace to the soul of the dead . Pilgrims those who are plan for sacred bath in theerthas should first took bath in Agni theertham and followed by that bath in theerthas inside the temple. The childless couples performing specific poojas (holy rituals) in the shores of Agni Theertha and offer their prayers to the Ramanathaswamy (The main deity of this temple), they believed that by performing these rituals and holy bath in rameswaram, they will be blessed with child. All the days in the year are considered as good days for taking a sacred bath in this theertha.But the amavasya (No moon day) and poornima (Full moon day) are considered as auspicious days. Particularly on tamil months Aadi (comes between mid of July to mid of August), Thai (comes between mid of January to mid of February) , purattasi (comes between mid of September to mid of October) amavasya days were considered most auspicious and special days for theertha snana (sacred bath) in Rameswaram. The Word Agni in Sanskrit means fire and it also refers to the god of fire, and theertham means sacred water. One may wonder that why this sea is called by the name of fire. After the rescuing his wife sita from the demon king Ravana, (To know about full story read this link ji here you have to attach the mythical story link) Lord Rama told her in a suspicion tone. “Sita I’ve rescued you from my enemy Ravan, and I’ve done my duty and satisfied the demands of honour, you may have been touched by the Ravana, How can I know that you are pure” and he distrust her purity. Sita got angry over Rama because of his suspicion and told to the Rama’s brother Lakshman that “ Lakshman ! , put a funeral pyre! 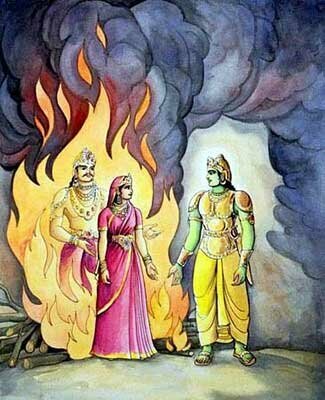 I intend to enter into the flames” , Lakshman put a pyre in order to respect the words of his brother’s wife, Rama neither stop her nor he said anything to her. Sita enters into the flames of fire. She prays to the lord of fire, “ Protect me Agni for you know that I’m pure of heart and body”. Truth in her words, deed, action and the prayer, the fire around her doesn’t hurt her. instead of burning her into ashes it made the fire god Agni to appear. The fire god Agni appeared before Rama and said “Ram sita is pure, Chaste and Sinless, you took her to your abode Ayodhya with you and rule the country with her”. The sea shore is situated opposite the RamanathaSwamy temple (due to the buildings and shops evolved around , you cant able to view the temple clearly from the sea nowadays). And Nearer to the parking Area. How to reach Agni Theertham? By taking Buses named “Temple” (1A, 1B, 2 )From Rameswaram Bus stand one can reach Agni Theertham (Last stop). From Government parking Area, walking straight towards the east direction will leads you to Agni Theertham.